The Habsburg Empire was a ramshackle, lumbering old giant centered in the Danube Valley that held a central place in European politics from the Middle Ages to the end of WW I, ruled by the dominant dynasty of Europe for four centuries, the Habsburg family. Winder set out to wander through the lands that used to constitute the empire, describing and reflecting on what he sees now, particularly in terms of the appearance of villages, towns, and cities, and what he knows through his research as to how things used to look when the Habsburgs held sway. Half an hour's drive north of me, following the path of the River Reuss, is the little hamlet of Habsburg. The first time I saw it on a roadsign, I assumed it was a coincidence, since the House of Habsburg is something I would generally associate with the bustling metropolises of Austria and Hungary, not a damp cowfield in the back end of the Aargau. But sure enough, this turns out to be where the whole gargantuan dynasty acquired its name. The ‘castle’ here was built in the 1020s, when castle technology was still pretty basic – it's really just a biggish drafty house with a little donjon tower attached, perched on a drab hillock. A minor count called Radbot built it, dubbing it, rather aspirationally, Habsburg or ‘Hawk Castle’. From the top of its low tower, you can pick your way around the splotches of pigeon poo (and indeed around the pigeons themselves), and peer hesitantly out of the embrasure – towards Vienna. Incidentally, it is generally around here that anybody writing about the Habsburg Empire is obliged to have a section on people like the Empress Elisabeth and her son Crown Prince Rudolf, but really if these people are of interest you should probably just look them up on Wikipedia, which has excellent entries. With even a smidgen less authority this would all seem dreadfully flippant, but fortunately it is soon obvious that Winder's knowledge, and his grasp of the material, is much greater than he's letting on. The mock-dilettantism is just one aspect of a fantastically engaging and discriminating narrative style, a style that sometimes seems to owe as much to Douglas Adams as it does to AJP Taylor or John Julius Norwich. The result feels rather like talking to a great historian in the bar after their lecture. This was one of those books that had me throwing up my hands with a renewed sense of how little I know: every chapter, every page, revealed enormous new vistas of my own ignorance. It was particularly galling since I've travelled a fair bit in the Balkans and other parts of ‘eastern Europe’ (an unsatisfactory phrase, as this book makes plain), and had quietly prided myself on knowing something of the area's history and culture. But in fact what was totally obscure to me was the extent to which this region had been connected to the west; the extent to which cities such as Lviv, Debrecen or Cluj were (in Winder's words) ‘part of a culture rooted in mainstream European values’, indeed a culture that was thought of as being at the heart of Europe's identity and character until really the twentieth century. Though Winder is careful to stress again and again the problems and contradictions in the Empire, it is hard not to be a little swept up in the sheer romance of a single entity that stretched from Bregenz on the shores of Lake Constance all the way to Braşov in the middle of what's now Romania, from Kraków or Prague in the north down to Trieste, Sarajevo, and the Croatian coast. In the context of the tumultuous convulsions that this region experienced over the last five hundred years, the Habsburgs themselves emerge as a rather baffling constant: always rather distant, sometimes downright inconsequential. Many are scarcely distinguishable – a tangle of Ferdinands and Leopolds – though some have attained a kind of legendary status, such as Rudolf II, who was obsessed with the occult and who had a lion and a tiger wandering round Prague Castle. And most of them were afflicted by various abnormalities that resulted from the generations of in-breeding – notably the famous ‘Habsburg jaw’, which makes a family tree of the Habsburgs look like a series of Jay Lenos in fancy dress; it affected one of the Leopolds so badly that his mouth would fill with water every time it rained. Winder keeps you distracted with bear-moats and lunatics while sneaking in a huge amount of geopolitical history under the radar. And approaching European history from this direction gave me a very new, and sometimes quite revelatory, angle on things like the Reformation, the Thirty Years War, or the revolutions of 1848. This is especially the case towards the end of the book as the First World War looms into view. From a British perspective, 1914–1918 is vaguely thought of as having been about fighting Germany, along with a few of their allies; this is all very well, but it does mean that the killing of some pooh-bah named after a post-punk indie band in an obscure part of Yugoslavia seems like an inexplicable reason for a global conflict. Here, though, coming at it through the morass of Imperial nationalisms and separatist movements, I felt things slotting into place in a completely novel way. It's perhaps surprising that a book this chunky – upwards of five hundred pages, before you hit the bibliography – ends up feeling so selective, but such is the result of Winder's faux-snap decisions about what is and is not of interest: he succeeds in building a powerful cumulative argument. This has to do with the fact of the Empire's being a ‘chaos of nationalities’, where ‘the very idea of “nation” was an unresolvable nightmare’. Instances of quite how contingent Central Europe is, in linguistic or political terms, are everywhere. Béla Bartók can stand for innumerable other examples: generally thought of as a ‘Hungarian’ composer, almost none of the places that formed him lie within the borders of the modern Hungarian state. He was born in Nagyszentmiklós (now the Romanian town of Sânnicolau Mare), then moved to Nagyszőllős (now the Ukrainian town of Vynohravdiv), then to Nagyvárad (now the Romanian city of Oradea), and then to Pozsony (now the Slovakian capital Bratislava). Indeed Bratislava itself only acquired its name in 1918, plucked more or less out of thin air by Slovak nationalists squinting heavily at some old manuscripts – before that, it had only ever had German and Hungarian names (Preßburg and Pozsony). Similar examples are piled up, until the overall sense is of an entire gigantic region whose multilingual, multiethnic nature has been obscured only by successive (and recent) waves of expulsions and massacres. The point is not a fluffy one of the necessity of getting on with each other (though certainly Winder comes to have an extremely negative view of nationalism, comparing it at one point to bubonic plague); no, the point is just that the borders and divisions of Central Europe are characterised by their near-total arbitrariness, with most of the modern nation-states having only the most cursory historical justification once the poetic myth-making has been set aside. I found this very moving, for reasons that are difficult to explain – or, perhaps, that are too obvious to go into. Winder enriches his story with just the right amount of personal anecdotes about his travels around the region – it never feels like someone talking through their holiday photos armed with a stack of museum pamphlets, which is the danger with this kind of project. And his constant references to the music and literature mean you will come away with a healthy further reading list. 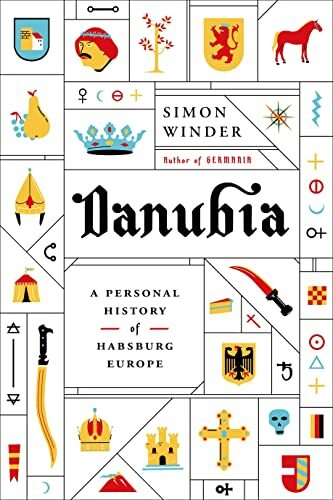 Danubia is a very quirky book - part history, part travelogue - written by a very witty Englishman. It describes the land once ruled by the Habsburg family, who formed governments dominated by Germans and Hungarians, even though the people over whom they presided were a mixture of various and numerous Slavic nationalities (Polish, Croatian, Czech, Slovak, Ruthenian, Slovenian, Galician, Bukovenian, etc.). In addition, the history of the area requires a discussion of the influence of the Serbs, Romanians, Bulgarians, Kosovars, Albanians, and Turks, not to mention the Avars, Huns, and Ostrogoths. Through most of their reign, the Habsburgs each took the title of “Emperor.” Often the "empire" in question referred to the Holy Roman Empire, founded by Charlemagne, but which (in Voltaire’s mot juste) was neither holy, Roman, nor an empire. In the 19th and early 20th centuries, the title referred to the Austro-Hungarian Empire. In all years, the extent and degree of power exercised by the Emperor differed greatly among various corners of the empire. However, even though none of the soon-to-be victorious powers had made any commitment to break up the Empire, its internal ethnic tensions were so great that the Empire simply ceased to exist. The organization of the book is somewhat whimsical. Rather than proceeding in a strictly chronological manner, Winder writes of his peregrinations in the area, and regales the reader with stories associated with each particular location at which he happens to stop. He can be a bit frustrating in that he frequently refers to specific paintings or buildings (with which he seems to assume the reader is familiar) to illustrate a point, but does not furnish the reader with a picture or reproduction that would clarify those illustrations. Nevertheless, I can overlook that flaw because most of the writing is quite sprightly and irreverent — one can almost hear a British accent in his prose. A number of maps are included.